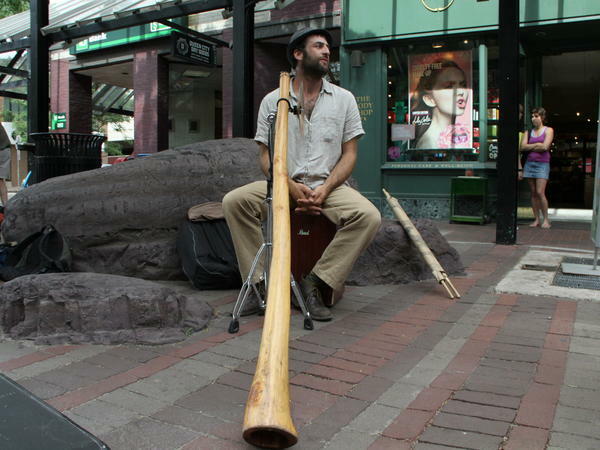 Michael "Tree" Sampson plays the didgeridoo on the streets of Burlington, Vt.
Vermont: Land of maple syrup, ski slopes, covered bridges and snow-capped mountains. Few people would associate the Green Mountain State with the didgeridoo, a wind instrument native to Australia. Until they've heard Michael "Tree" Sampson, that is. Sampson's a one-man band who performs daily on Church Street in downtown Burlington. "I grew up in upstate New York and I've been trying to survive as being a street performer in New England for the last couple of seasons," Sampson says. "I play didgeridoo and el cajon — a box drum — have puppets on my feet and a tambourine on my foot and a shaker on my other foot. "I use crafts and visual media along with rhythm to just break people out of their patterns — just shaking them up." Sampson also performs in a homemade mask that, depending on who you ask, resembles a deer, an owl and other animals. "The wooden mask was originally supposed to be a deer mask," he says. "The nose didn't work out and all of a sudden it's worked its way back into this kind of owl-human, just nature-spirit thing." Sampson says he thinks of himself not only as a musician, but as a healer, too. You're kind of trying to be like a kind of magician," he says. "It brightens people's days and kids dance. Things with rhythm that make you dance, they're healing. They're good for the public." Vermont, land of maple syrup, ski slopes, covered bridges and snow-capped mountains, not likely on this list. WERTHEIMER: The didgeridoo. This summer on WEEKEND EDITION, we've been listening to the sounds of music from America's streets. Today, we present this audio postcard of a one-man band on Church Street in downtown Burlington, Vermont. TREE SAMPSON: My name is Tree Sampson. I grew up in upstate New York, and I've been trying to survive as being a street performer in New England for the last couple of seasons. SAMPSON: I play didgeridoo and el cajon, a box drum, have puppets on my feet and tambourine on my foot and a shaker on my other foot and I wear a mask, and I use crafts and visual media along with rhythm, to just break people out of their patterns. Just shaking them up and making them go, what? What is going on there. The wooden mask was originally supposed to be a deer mask. It's an ash tree that I got in Maine. I cut the taproot and flipped it around and retained the roots to create, to use as antlers and then sheared the other roots for ears. And it's supposed to be a deer but the nose didn't work out and all of the sudden it's worked its way back into this kind of owl-human, just nature spirit thing. It seems really with the didg and the sound. It just increases the effect on the people. You're kind of trying to be like a kind of magician almost. SAMPSON: I just started playing the guitar and playing a harmonica. I'm playing American music, and I spent time outside of the States. And it just didn't seem, the blues and everything was so sad and - or else the rock and roll just seemed so heavy, I got into didgeridoo. And it brightens people's days, kids dance. And so things with rhythm that make you dance, it's just like they're healing. They're good for the public. WERTHEIMER: That's Michael "Tree" Sampson, playing on the streets of Burlington, Vermont. You can see a video of him wearing his mask and playing his didgeridoo on npr.org. And our thanks to Kirk Carapezza from Vermont Public Radio for this recording of Tree Sampson.